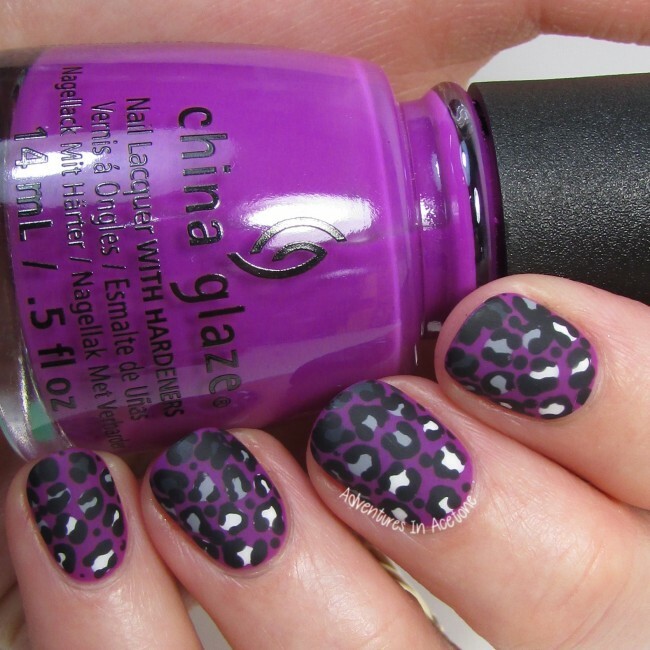 40 Great Nail Art Ideas, Violet: Gradient Leopard Print! Good afternoon, readers! 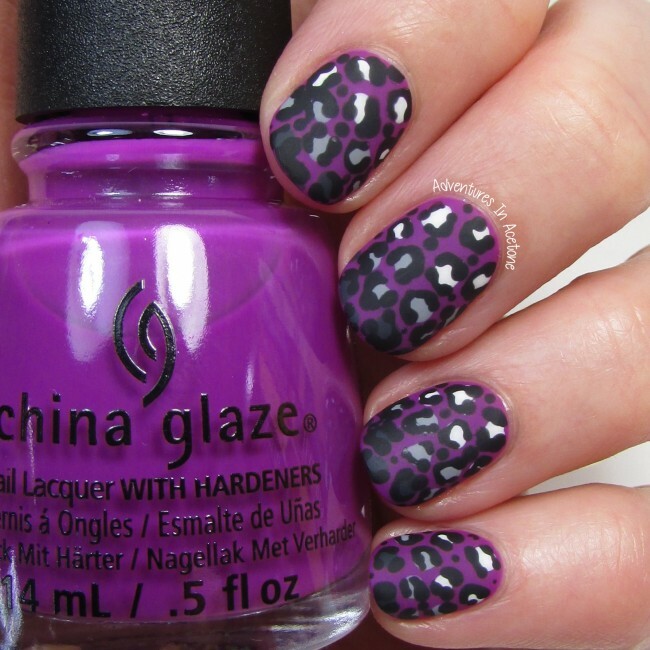 This week’s 40 Great Nail Art Ideas prompt is Violet. I went with a base of China Glaze Violet Vibes from the Electric Nights Collection and used a dotting tool for a gradient leopard print over it. I love the look of the neutral spots over such a fun base. I started out with three thin coats of China Glaze Violet Vibes and let dry. Then, I used a dotting tool to make dots from light at the cuticle to dark at the tips in this order: OPI Alpine Snow, OPI Cement the Deal, and OPI Dark Side of the Mood. Once those were dry, I used the same dotting tool and “drew” around the dots for a leopard print with OPI Never Have Too Mani Friends!, adding in some dots in between the leopard spots. A coat of KBShimmer Clearly On Top was used to seal in the design and help with the drying process. Lastly, I added a coat of KBShimmer Oh Matte! for a matte finish. 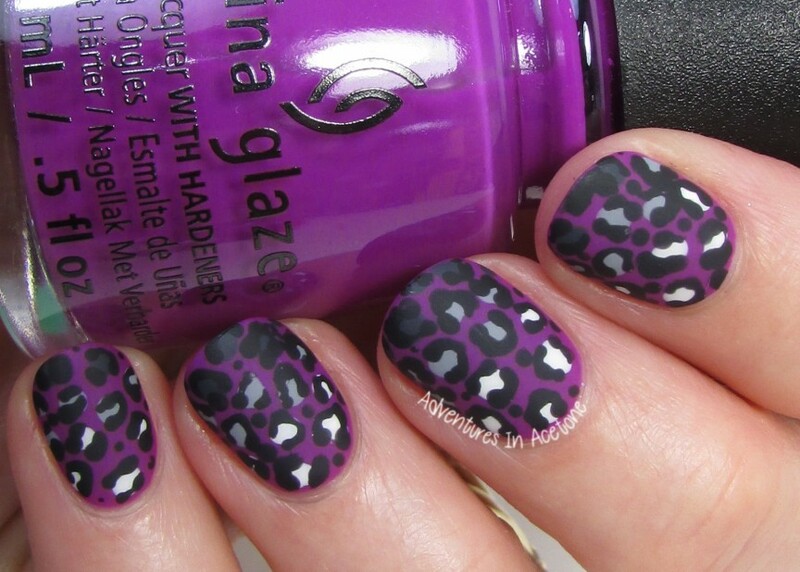 I love the idea of a gradient leopard mani using different colored dots. Violet Vibes is such a nice violet shade, and the matte finish gives the look a new feel.